Taliaferro, Charles and Chad Meister. Contemporary Philosophical Theology. New York, NY: Routledge, 2016, pp. 242, $44.95, paperback. The authors are both well-established experts in the fields of philosophy and philosophical theology. 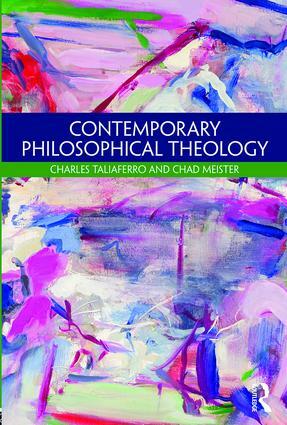 Charles Taliaferro, Professor of Philosophy at St. Olaf College, is the author, co-author or editor of over twenty books. Recent books include The Golden Cord: A Short Book on the Sacred and the Secular (University of Notre Dame Press, 2012) and The Image in Mind (Bloomsbury, 2013, co-authored with Jil Evans). He is the co-editor of The Routledge Companion to Theism (Routledge, 2012, with Victoria S. Harrison and Stewart Goetz) and The Ashgate Companion to Theological Anthropology (Ashgate, 2016, with Joshua R. Farris). Chad Meister is Professor of Philosophy and Theology at Bethel College. He, too, is the author, co-author or editor of over twenty books. Recent books include Christian Thought: A Historical Introduction, second edition (Routledge, 2016, with J. B. Stump) and Introducing Philosophy of Religion (Routledge, 2019). He is co-editor of The Cambridge Companion to the Problem of Evil (Cambridge University Press, 2017, with Paul Moser) and God and the Problem of Evil: Five Views (IVP Academic, 2017, with James K. Dew, Jr.). 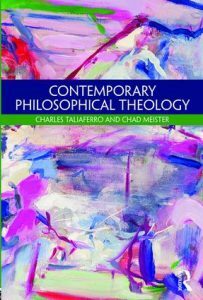 Together, in Contemporary Philosophical Theology, they offer a solid introduction to and defense of philosophical theology. One valuable feature of the text is the authors’ careful analysis of the discipline of philosophical theology. They maintain that “philosophical theology involves critical, disciplined reflection on the concept of God or the divine” (p. 2). They note that one may do philosophical theology from the inside, as a member of a religious-philosophical tradition, or from the outside, with a sympathetic understanding of a tradition of which one is not a member. The authors contend that to engage in such reflection, either from the inside or the outside, requires an appreciation for and a sympathetic understanding of various philosophical and theological methodologies. This makes it possible, for instance, for a Christian or Hindu to make valuable contributions to Islamic philosophical theology. The first few chapters respond to critics who object that science has somehow demonstrated the impossibility of philosophical theology. These chapters alone are worth the price of the book. For instance, chapter one considers the objection that because the methods of philosophical theology cannot be empirically or scientifically tested, discourse on or about God is ungrounded. Critics go on to conclude that only explanations rooted in physics, chemistry, and biology, and the like, are rationally acceptable. But this link of thinking fails, our authors argue, because it assumes the primacy of the methods and practice of science. In short, these critics make a substantive philosophical assumption that begs the question against philosophical theology. Moreover, these ‘scientific’ critics of philosophical theology tend to overlook the fact that we are much more deeply acquainted with mental realities than we are extra-mental physical realties. A careful study of these chapters shows that the methods and practices of philosophical theology are not necessarily incompatible with the methods of science. Chapter three covers the topics of pluralism and religious diversity. The authors defend the view that pluralism and religious diversity provide us with an opportunity to encounter and to consider the divine from multiple vantage points. One highlight of this chapter is a discussion of how some critics of reasonable religious belief display unwarranted bias towards miracles and religious belief. Kitcher’s case against religious belief, for instance, depends on drawing a stark contrast between religious claims about a transcendent reality and scientific claims about the physical world. He assumes that concepts of physical reality, including the nature of causation, matter, and physical reality, are philosophically stable and conceptually clear. But, as contemporary physics goes to show, these concepts are rather murky and philosophically problematic. Chapter four covers reasons and revelations. Here the authors propose that “there are cases when the appearance of divine disclosure counts as evidence that there is disclosure of the divine” (p. 79). In the light of the possibility of divine disclosure, they argue that Hume’s case against rational belief in miracles, when shorn of its loaded language and once we take note of his prejudice against and his misguided assumptions about religion, is rather weak. They go on to propose that theistic arguments have more force once religious experience is considered. Chapter five is a standard account of divine attributes and chapter six and seven cover the notions of good and bad and the problem of evil as it pertains to philosophical theology. Those new to these issues will find this material helpful. Chapter eight is a philosophical exploration of important theological and religious themes in Judaism, Christianity, Islam, Hinduism, and Buddhism. This chapter covers a lot of ground but does not skimp on details. Highlights include discussions of Hindu notions of karma and reincarnation and Buddhist teachings of no-self (briefly, the view that there is no substantial self) and Nirvana. Chapter nine considers the sort of cultural and educational role that philosophical theology may play in a democratic society. This book is an excellent introduction to philosophical theology. While tightly argued and sophisticated, it is not overly technical. Those well versed in theology but new to philosophy should not have trouble digesting the main ideas but those doing it for years or decades will find valuable insights. The book is broad in scope and inclusive. It not only covers the Christian tradition, but also considers topics and issues that are unique to Jewish, Islamic, Buddhist, and Hindu traditions. All students of philosophy and theology will benefit from reading this book. Professors will appreciate its pedagogical features. In addition to extensive references, at the end of each chapter are ‘further reflections’ sections designed to stimulate scholarship and discussion. There are plenty of ideas in these pages for paper topics, for students as well as scholars.